Emanuel joined a packed house at Apple Michigan Ave. as Chicago youth demonstrated apps completed as part of Apple's Everyone Can Code program. The presentation was conducted in a special Today at Apple session titled "One Summer Chicago Student App Showcase," where students walked attendees through their projects on Apple's big screen TV. Other students and members of the public crowded around the large display, sitting on wooden stools and concrete bleacher seating that makes up the store's second level. Apple CEO Tim Cook also highlighted the event in a tweet today. "Young developers like Fahmeen, Afreen and Amelia are building apps to help their local communities. 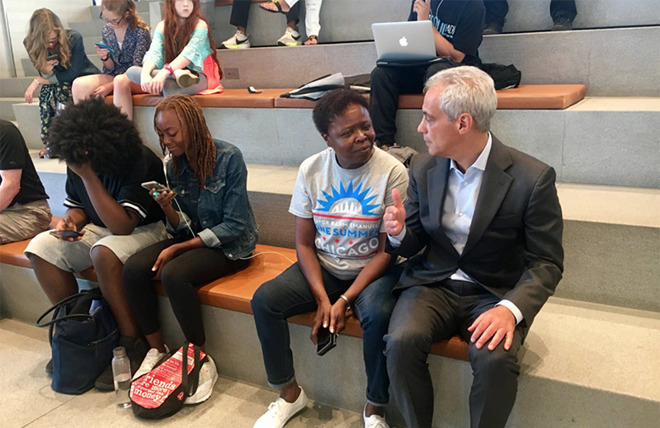 Thanks to @ChicagosMayor and @1summerchicago for helping us showcase some of the creativity and passion coming out of our Everyone Can Code initiative in Chicago," Cook said in a post to Twitter that included a photo of three student developers presenting their creation, Chicago Public Schools' "The CPS App." The brainchild of Emanuel, One Summer Chicago offers 32,000 employment and internship opportunities from government institutions, community-based organizations and companies to city youth aged 14 to 24. Apple partnered with Emanuel's program in December as part of an expansion to the Everyone Can Code initiative. Chicago Public Schools and City Colleges of Chicago began teaching Swift in the spring. One Summer Chicago and local tech non-profit 1871 said it would offer 100 internship positions to high school and college students who finished the Everyone Can Code curriculum. Apple is pushing coding educational curriculums, specifically those based on Swift, through initiatives like Everyone Can Code. The company has long fought for a place in the education market, first with desktop and laptops, but more recently with its iPad hardware lineup. A new 9.7-inch iPad released in March targets the classroom with Apple Pencil support and a relatively low price tag of $329, or $299 for educational institutions. In a March interview with MSNBC, Cook reiterated Apple's stance on coding, saying study of the language is key to building a strong learning foundation. "I want America to be strong, first and foremost, and I think to do that, we need to code," Cook said. "It is a language and it is everywhere in our life. It is problem solving. You need critical thinking to know what is fake and what is real."